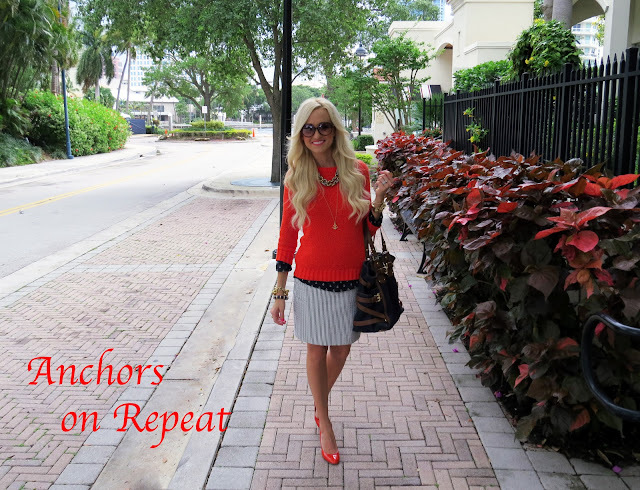 I think it is safe to say I have a small addiction to anchors this time of year! I don't know why! I just end up wearing them without even thinking about it or planning it! Sorry for the anchor overload! Shirt: J.Crew (old) love this one, Sweater: J.Crew, Skirt: J.Crew, Shoes: J.Crew (old) love these, Bag: Michaels Kors (old) love this one and this one, Necklace: Both J.Crew, really need this one and this, Bracelets: J.Crew, c/o Poshlocket, love bracelet Etsy, Sunnies: Gucci (old) love these Warby Parker, Lips: Vegas Volt. 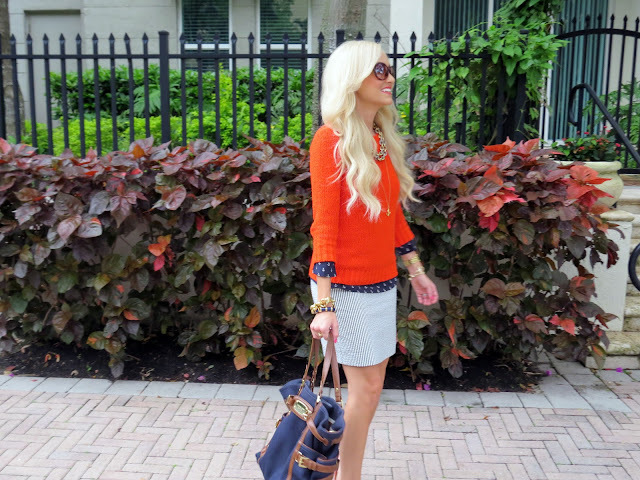 This sweater is another item I picked up last week at the J.Crew sale! And here is another way that I wore this combo last week! When I find something I like I usually wear it nonstop for the first couple of weeks! I don't know why I do that! This is so cute! I absolutely love all the nautical touches - the blouse and the anchor bracelet are adorable!! I love both ways you styled the outfit! - I do the same thing sometimes, when I'm in love with a certain item or pairing, I seem to wear it waaay too much! I love both outfits!! I get the same way about wearing anchors this time of year! I love both combinations! The little anchors go so nicely with your cute seersucker skirt. 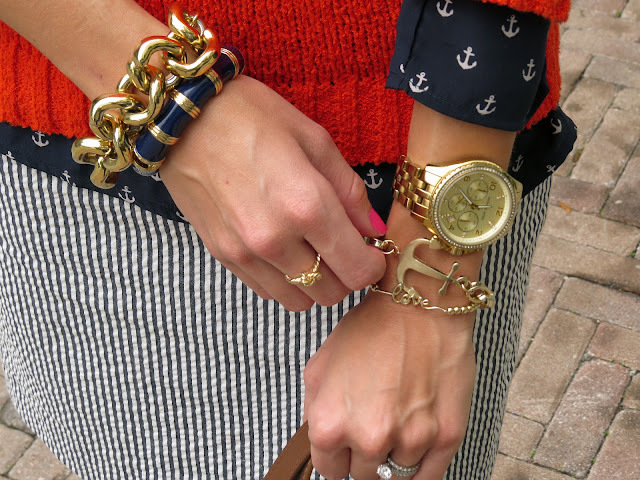 You're right, nautical pieces are so perfect when the weather starts getting warmer! love the print anchor shirt! so cute! Me gusta mucho más el look con los shorts!!!!! el jersey me encanta! y la camisa es preciosa!